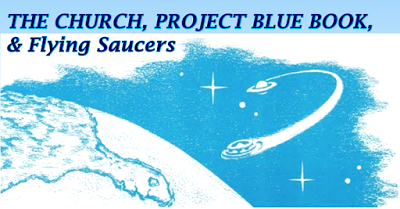 An unlikely source for UFO history that time forgot… a six-part series from 1961 in a religious magazine, the Seventh-day Adventist Church’s Review and Herald. It was written by the editor, Francis David Nichol, in his attempt to find answers for his readers. In addition to the motley array of saucer club enthusiasts, mystics, and spiritists, there are other people, genuinely good people, sincere, hard-working citizens, some of them religious folks—a few even in the circle of our church—who are greatly impressed by the reports of UFO’s and who think that they may be manifestations of evil spiritistic power, a proof of the nearness of the end of the world. For such people we have a sympathetic concern, and wish to make explicit that we consider them in an entirely different category from the run-of-the-mill flying saucer enthusiast. In fact, it is because of the letters of inquiry from some of our subscribers that I have made this investigation and here publish the report of my findings. Nichol’s quest to get to the bottom of the flying saucer mystery caused him to to travel to interesting places and meet memorable people from UFO history. Nichol examined the Contactee tales, travelled to NICAP headquarters, the Pentagon, and in Ohio, dug through the filing cabinets of Project Blue Book.